Freedom, Democratic, Good, Patriotic, Civilization, Organic, Fresh, Natural, Honorable, Potential, Virtuous, Patriotic, Independent, Scientific, Strong, Healthy, Hope... All of these "attractive" words mean different things to different people, yet, they are often used vaguely by advertisers and politicians to stir up emotions without presenting any concrete information. A Glittering Generality is the misuse of vague words with positive connotations in order to influence people, seeking their approval without reasoning. ...particularly in art criticism and literary criticism, it is normal to come across long passages which are almost completely lacking in meaning. Words like romantic, plastic, values, human, dead, sentimental, natural, vitality, as used in art criticism, are strictly meaningless in the sense that they not only do not point to any discoverable object, but are hardly ever expected to do so by the reader ... Words of this kind are often used in a consciously dishonest way ... Statements like ... true patriot ... freest in the world ... opposed to persecution, are almost always made with intent to deceive. Other words used ... dishonestly, are class, totalitarian, science, progressive, reactionary, bourgeois, equality. 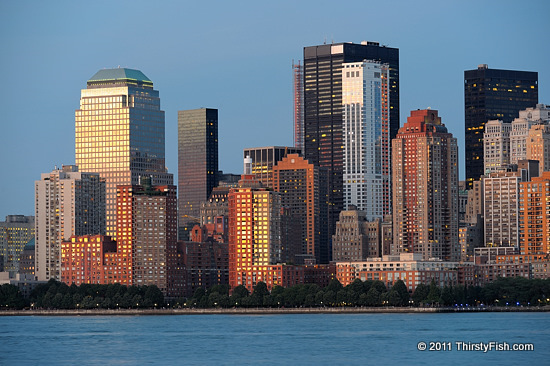 The photo is of a glittering view of Downtown Manhattan Buildings just before sunset.